You are about to enter a one-way street from the wrong direction. You may proceed if the way is clear. 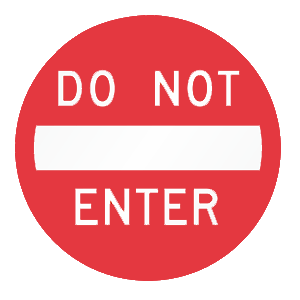 This sign marks a one-way road, entrance, or exit. If you are facing this sign, traffic is coming toward you. Turn around if you are driving toward this sign. 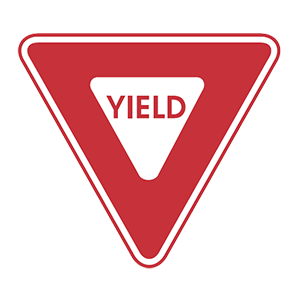 A downward-facing triangular sign is always a yield sign. Drivers must be prepared to slow down or stop when approaching a yield sign. Security guards patrolling parking lots. Other drivers whose vehicles are broken down on the roadway. Flaggers (signal persons) at construction sites. Drivers must obey special signs or instructions given by flaggers. They are in place to keep drivers and workers safe. The term “distracted driving” refers to driving while anything takes your eyes, hands, or mind away from the task at hand. Distracted driving is the most common contributing factor to reported traffic collisions. Distractions of any sort cause drivers to miss key visual and audio cues needed to avoid a crash.